I have a National Craft Month Challenge to myself to post everyday in March. Some of those postings will be on Facebook, some here on the blog & there will be a live video or two also. Working my way back into sharing now that I am more recovered from surgery. What was a simple surgery to open up my airways, turned a bit more complicated when a mass was found to be blocking the airways (benign, thank-you Lord! ), and then finding out this week that the reason it’s taking so long to heal is apparently I had an anesthesiologist who decided to tear up the roof of my mouth suctioning during surgery. Eating & swallowing has been most difficult to say the least. Thankful to finally be on the mend, understand why, blessed the mass wasn’t serious & working my way to purge the studio more, organize & play with lots of crafty new goodies! Let’s take a look at today’s card. One of my favorites from our birthday class but was a bit tricky to fussy cut as I decided not to purchase the die when I got it. If you like it, purchase the die, LOL! This a Pinterest case modified of course because I can. We also created a small set of these for the troops. Cut a card base from Grape Fusion cardstock 4 1/4″ x 11″ and fold in half. Cut a mat out of Whip Cream cardstock 4″ x 5 1/4″. Stamp with the Border Line stamp from Spellbinders in Black Licorice. Stamp My Favorite Things Beautiful Bloom onto Grape Fusion cardstock with clear pigment ink & gold emboss. Die or fussy cut out and trim in half down the middle. Adhere to card as shown. Stamp sentiment from Penny Black Sprinkles & Smiles set in Grape Fusion in card center, clean stamp & restamp in clear pigment ink & emboss with custom clear embossing & Sparkle Dust mixture. The Events page has been updated with the March classes, take a peek & join us in studio for some creativity. 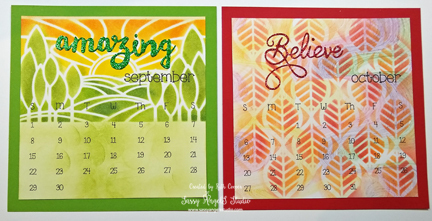 I hope this month’s shares will inspire your creativity during National Craft Month. Recently I held a foiling class using the Spellbinders Glimmer Machine. After class I needed to make my dear friend Margaret a birthday card, so since the machine was out I did a “Happy Birthday” sentiment. After I designed the card, I liked it so much, that I decided to make it our club card too for this week except I changed it from pink & red to red & silver. Margaret loves red & this came out so elegant. The club version is even more classy. These cards are so beautiful & easy to make. Cut a Cranberry Bliss card base 5 1/2″ x 8 1/2″ and fold in half. I used the Happy Birthday from Becca Feeken’s Elegant Occasion Sentiments Hot Foil Plates to create the foiled sentiment. I like this set because it has matching outline dies to cut the sentiment out when done. The Glimmer machine is very easy to use. Pop sentiment up on card with foam squares & add rhinestone accents. Thanks for stopping by. More shares coming soon. I am working harder to make my art & posting a priority with this year’s schedule. Sometimes trying to figure out my schedule timing is a bit of work depending on if the week has a lot of out of the house appts & errands like last week or is middle of the road like this week. Since my schedule flexes quite a bit, choosing a time to post & do videos consistently just doesn’t work. So I am trying to go back to a weekly goal of regular posting & videos & then I’ll see where the time allows each week to meet that goal. So I may post at midnight tonight & 9 am in a couple of days. Going with the flow. We made this card for Angel Club last month and the bonus was everyone got to take home the extra trees they cut out in the other colors to create more cards with. Cut a card base from Grape Fusion Cardstock 4 1/4″ x 11″ & fold in half. Using a 4″ x 5 1/4″ Whip Cream mat, position your stencil over the mat & secure with some washi tape or magnets. Apply Peacock Feathers Distress Oxide ink about 2/3rds down the mat from the top. Apply Wilted Violet Distress Oxide ink about 2/3rds up from the bottom of the mat to create the deeper purple center on the mat when the 2 inks combine. Adhere to card base. Cut a stitched oval mat from Turbo Teal cardstock using Journey Ovals. Cut Heart Tree 3 times from Grape Fusion, Electric Lime & Cosmic Grape cardstocks & piece together as desired. (Note: Cosmic Grape cardstock is no longer available,) Adhere to oval. Highlight some areas on the tree with Sparkle Dust. Cut Penny Black love sentiment from Black Licorice cardstock & attach over tree. Pop oval up onto card base. Have a Fabulous Week & I’ll pop back in soon with another great project. I hope you are enjoying a fabulous weekend! Ours is a bit cold, so there is a stew in the crockpot & I am playing in artwork all day inside snug & warm. If you got the chance to see my last video on Facebook, I showed the projects we created in the Key to My Heart Class featuring the new FSJ Stamp of the Month. I said I would post a few pictures so you could see the projects better & here they are. The wings box was showcased on the project sheet that arrived with the stamp set. When I saw it previewed, I knew it was the perfect class project & yes I changed it up some. My colors are fairly true to the original sample except I custom mixed the outside color with my acrylic paints to match. The outside of the box was pretty plain so I took one of the key stamps & added some interest to the back & sides. I removed the little hanger at the top & replaced it with a key. The key represents the one that unlocks your wings so you can fly. How fun it was to get all glittery making the box & the Angels customized their colors in class. Here is a look at the card I demoed on the video. I have been watching technique videos while I have been walking on the treadmill. I saw this card design on a My Favorite Things Stamps video with stamped trees & switched it to hearts with the Heart Wall Stencil. This makes a great no layer card. This last card is a Pinterest CASE. I loved the clean white with a pop of color so I redid it for class. 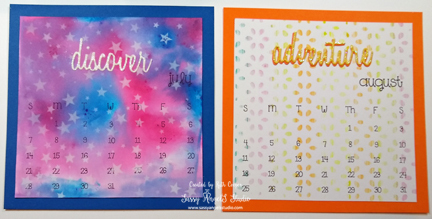 The colored background is made with Color Burst colors on the Gel Press. Easy & fun. Maybe I’ll pop in next week with a technique video. I hope you enjoyed this class close-up. It’s lots of fun to design & create for class & there is so much inspiration available to inspire your creativity. When I see a technique or share online that I like, I start thinking “Oh, that would make a great class!” or “I like the concept but I’d change it up this way.” So thanks to those artists that share their artwork to spark more ideas for other artists. Welcome to 2019! I am wishing you love, joy, laughter & tons of inspiration & creativity in the new year! I am definitely looking forward to sharing more inspiration with you! LOVE – yep I’m going to have fun with this years word too. While we were in Branson recently, I spotted a sign I wanted for the studio but since we were Christmas shopping bypassed it. Well while I was shopping in the Scrapbook store, hubby went back & got it for me for my Christmas stocking. It has Van Gogh’s quote hand painted on it by a young artist that says “I feel that there is nothing more truly artistic than to love people.” This sums up my love of creating & Sassy AngelS Studio, sharing artwork to brighten others day. Whether I am sharing something online with you, teaching in studio, creating Cards for the Troops, Salvation Army or Feed His Sheep, sharing art with my granddaughter or making a special gift, it’s all to share love, encouragement, hope & inspiration. 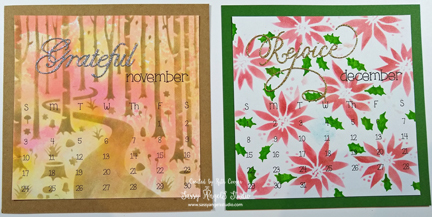 Today’s card was made during the Fun Stampers Journey December Follow Your Heart event. While we were watching the show, they demoed using the heart stencil over the patterned paper so I created this card using that technique with the Angels. Let’s take a look at how it was created. Cut a card base from Tin Pail cardstock 5 1/2″ x 8 1/2″ & fold in half. Emboss card front with the I Heart embossing folder. Trim a patterned strip 1 3/4″ x 5 1/2″ from the Follow Your Heart Prints. Sponge heart pattern over the strip using the Heart Wall stencil, Turbo Teal ink & sponge daubers. Trim a mat piece for the strip 2 1/4″ x 5 1/2″ from Turbo Teal cardstock and adhere patterned strip to mat and attach to card base. Die cut Penny Black Soft Caress in Lemon Grass cardstock. Using the Love Is punch, punch hearts from blue glitter paper & adhere over heart flowers on die cut. Adhere to card. Die cut small purple glitter hearts using the Heart Strip Die & adhere to edges of card. Stamp sentiment from the Cottage Bouquet stamp set on Tin Pail cardstock square in Black Licorice. Clean stamp & stamp again in Clear Pigment ink. Emboss with custom Journey Clear embossing powder & Sparkle Dust mix. Pop up on card. Look for class updates in the next couple of days. I am in full out purge, organize & clean mode for the New Year so haven’t updated everything yet. Do something special for yourself this week. I hope you have had time to catch your breath from all the holiday bustle & perhaps spend some time playing with new art goodies. Today’s share is the anniversary card I made for my oldest daughter & son-in-law for their 17th wedding anniversary. I used the new Penny Black Nose to Nose stamp I picked up in Branson. Originally released for the holidays, I think this stamp makes a great anniversary, love or Valentine card too. Let’s take a look at the basics. Cut a card base 5 1/2″ x 8 1/2″ from Cranberry Bliss cardstock & fold in half. Cut a mat 4″ x 5 1/4″ from Brushed Silver & emboss with Darice Tribal Background embossing folder. Attach to card. I used Spellbinders A2 Curved Matting Basics set B to trim image & cut a matching Cranberry Bliss mat. Adhere both layers together & pop onto card. Since the sentiment distracted from the image on front, I stamped the new Fun Stampers Journey sentiment “All you need is love” on the inside of the card from the All The Feels stamp set. Now that the holidays are coming to an end, before you put those holiday stamps away, take a look at them & see if some of the images are suitable for everyday & other occasion cards. It’s a great way to get your stash to stretch further. If you haven’t already, take a bit of quiet time for yourself to recharge before the New Year’s celebrations begin.